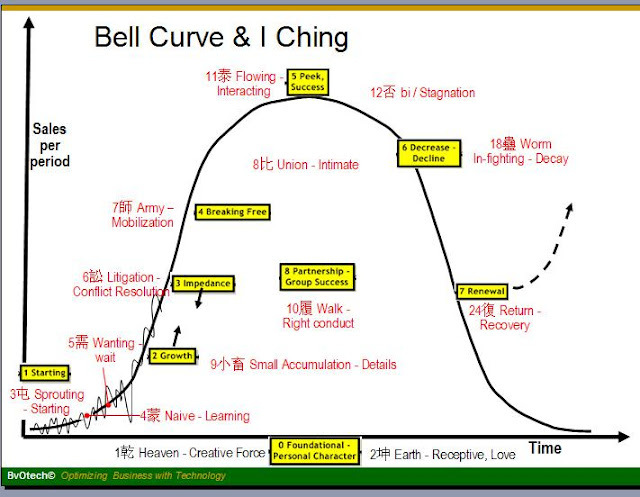 People who study innovation will be familiar with the S-Curve and the Bell-Curve. 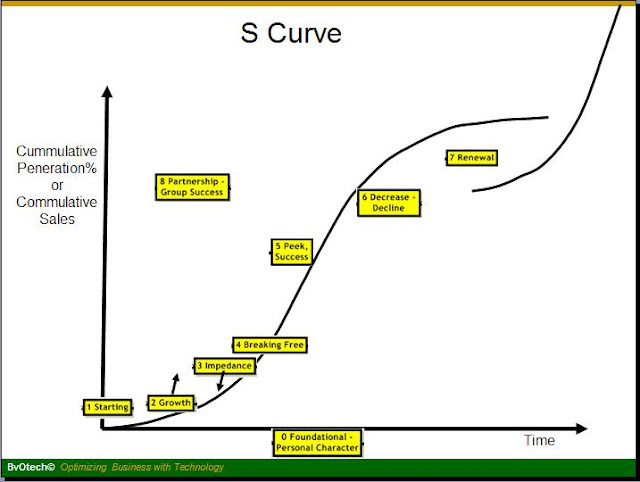 S-Curve is the accumulation of performance, sales or %penetration over time. It is the integral (sum, area) of the Bell-Curve. Bell curve is the sales over period of time. For any new innovation, it will grow, peak, stagnate and then decline and death. G Moore pointed out in “Crossing the Chasm” that the grow for a particular innovation may die a premature death if it fails to cross the chasm. The bell curve is not smooth and many innovations will not survive to go through the whole curve. The teaching of I Ching actually agrees with that. While there are 6 stages in each hexagram, promotion to the next stage is not automatic. Most likely, many will not get higher, and many will even drop off if the advices are not heed. I will use the bell-curve to categorize the hexagrams for ease of reference and understanding as stated in the earlier postings. Here are the curves and the corresponding Hexagrams. Only the lower number hexagrams are illustrated. For the complete list, refer to part 03. The fundamental hexagrams like the 01-乾 Heaven – Creative Force and 02 坤 Earth – Receptive, Love are applicable throughout the life cycle. For the starting phase, we have the “03 屯 Sprouting – Starting is hard“. The growth curve is not smooth but with lots of up and down as depicted in the diagram. We need to learn fast with “04 蒙 Naive – Learning“. We will have needs and must know how to wait for the right opportunities with the “05 需 Needs – Wait for the Right Time“. There will be the typical situations of misunderstanding internally and externally resulting in disputes. How to prevent and handle disputes is taught in “6 Litigation – Conflict Resolution” Hexagram. Growing start-up business requires one to take care of the details, save and accumulate experience, resources, conserve cash etc. The less you need of external help and investment, the higher the valuation of your company. This is covered in “09小畜 Small Accumulation – Improvement in Details” please. Disputes are just one of the many impedance for growth. Others, include 12-Stagnation, 25 无妄 Not Bizarre – Follow the Principles , 29 坎 The Pit – Danger –Be Watchful & Righteous etc. To break free and to grow quickly, we must know how to mobilize the resources. This is taught in “07 師 Army – Mobilization & Management“. “08 比 Union – Relationship Building” tells us to build good relationships with people – staff, customers, suppliers, and partners. This will bring forth great flow of activities and success to the main-street – “11泰 Great-Vibrant Flow of Abundance and Peace”. In the midst of great success, it is important not to forget about the building of relationship and partnership. Good relationship comes from “10履 Walk – Right conduct & Positioning“. Great success brings forth complacency and may result in “12否 Stagnation – Don’t Give Up” and worse, in-fighting and decay in “18蠱 Worm – Removing Disorderliness“. Unless this is followed by “24 复 Return – Recovery to Basic and Original Vision” to get a recovery or else pending death. There are two other hexagrams “40解 Freed – Get with Decisive Actions ” and “43 夬 Breakthrough – Power with Caution ” that address how one could transform and take off from the next S-Curve. Hope you now know how to apply I Ching to your business building. This Bell-curve can also apply to our relationship – how to build-up, and how to renew when the relationship has stagnated or worse is decaying. Hope you can begin to grasp the usefulness of I-Ching teachings – which is actually very Biblical. They are founded on the “Fear or Respect” of God – the beginning and wisdom and knowledge. Pro 1:7 The fear of the LORD is the beginning of knowledge: but fools despise wisdom and instruction. The regrets of Chinese Classics authors are that they recognize the work and wonder of God the Creator, they did not know that the Great God comes in the person of Jesus Christ who wants to develop a personal relationship with the men he created. The union of God and Man 天人合一, the wish and objective of I Ching, is realized in Jesus Christ. We need the Christ in Us to do the teaching of I-Ching becoming the superior man!